Ok, so I've come up with a bit of a concept. Seeing as these posts will probably become a bit more frequent I've decided that they need a name... and a concept! So, what I'm going to do is to choose a trend, set a budget and see what I can find. Anyone with a trend for me to hunt down at bargain prices, throw them at me (ok, not literally... just post a comment below or tweet me). 'Low Spend, on Trend' was the best name I could think of for these posts at this moment in time. I'm open to any other suggestions - but it's got to be somewhat catchy (and preferably more grammatically correct than my idea). Enough jabbering on! 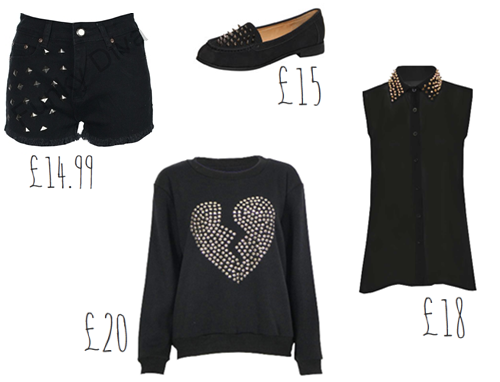 I love this whole spikes and studs trend and I love black, so I actually really like everything I've picked out here! My favourite find of this bunch is the shirt / blouse (I'd say shirt, but it's described as a blouse, advise me?!). If I had the money, I'd actually buy this right now! The shorts look good length - not hot pant risque-ness, a more (as the oldies would say) 'appropriate' length. I've seen lots of people wearing the Topshop Vectras now and as nice as I think they are, I rarely find pumps comfortable. I really like thes spiked loafer alternatives and I think they're cheaper than the Vectras (correct me if I'm wrong)! The jumper is ideal for our temperamental summers here in the UK. I usually layer, or at least take a jumper with me anywhere in the summer months just in case! Might seem a bit pessimistic, but let's not lie, there's probably more than a 50/50 chance it will rain! Ps. I AM DISGRACED! I didn't realise that since renaming my blog word verification had been turned on?! Huge apologies - I know how annoying it is an I'm a faithful slagger-off of the darn thing! I hope it's now been removed! Such a clever idea, i love everything you chose!